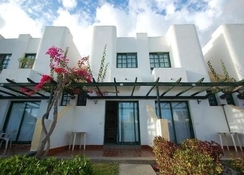 Capri Bungalows is a 2-star bungalow complex located in southern Gran Canaria, just 3km from a sandy beach. The hotel is within easy reach of bus stops, bars and restaurants as well as a lively nightlife and a variety of shops. Well-furnished guestrooms with warm hospitality promise guests a comfortable stay during their beach holidays in Gran Canaria. The family friendly hotel offers a lovely pool, children's pool, a comfortable a mini market, a reception and a lobby. There is a golf course located just 2km from the hotel for any avid golfers out there. Capri Bungalows offers the perfect retreat for those who seek peace and tranquility for who wish to be away from the hustle and bustle of Gran Canaria. 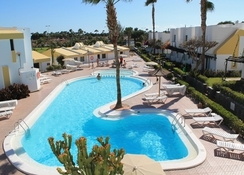 Capri Bungalows is situated in Playa del Ingles, just 3.1km from hotspot Yumbo Centrum and 3.7km from Maspalomas Beach. The city centre is barely 3.6km from the apartment so if you do want something a bit livelier then you won’t have to travel very far to find it. The San Augustin beach is about a 3.8km away and the Play del Ingles beach is 3km. The nearest airport is Gran Canaria Airport which is 32km from the hotel. The Maspalomas Golf Course is 1.1km away. All apartments at Capri Bungalows have two single beds and a sofa bed in the living and dining area, ideal for families with kids and couples. 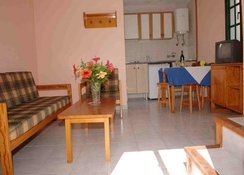 Rooms have satellite TV, a kitchen equipped with a fridge and basic kitchenware to make snacks. Each individual apartment has its private balcony or terraced area, allowing you to soak up the sun in the day or chill out to the tranquility of the surrounding area at night. With a kitchen and a refrigerator in every residence, bungalows at this property enable you to cook up a fast bite to as per your convenience. The large range of affordable restaurants nearby to the Capri Bungalows makes it easy to find somewhere to eat out. Lunch and dinner are served within the hotel’s restaurant where expert cooks serve up local and international delicacies with the freshest of ingredients and a bar is open throughout the day. A handy grocery store also allows you to stock up on groceries or toiletries throughout your stay. The hotel showcases a large outdoor swimming pool, with separate area for children to play in. In addition to the pool guests can unwind with a spot of badminton, or maintain their exercise regimes with the on-site gym equipment and other fitness facilities. Billiards are offered at the hotel. Golfers have the opportunity to play at the nearest golf course which is 2km from the hotel. We enjoyed our holidays at Capri Bungalows for ten days. The apartment was clean, spacious, the cooking facility and the fridge was well kept. They also have a small shop next to the reception for the convenience. 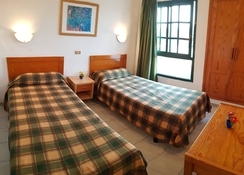 Never use the food or bar facilities but was very clean, relaxing, quiet and enjoyed walking to Maspalomas beach and play del Ingles also used Bus and taxis for getting home as it is a bit out the way but was ideal for my needs. Pool was clean and by the look of the amount of kids and adults enjoying it was very popular. Accommodation was basic but that's in the cost , beds not the most comfortable but used the front room cushions and was fine. Really enjoyed it and going back to Gran Canaria in November and will be looking at staying here again.